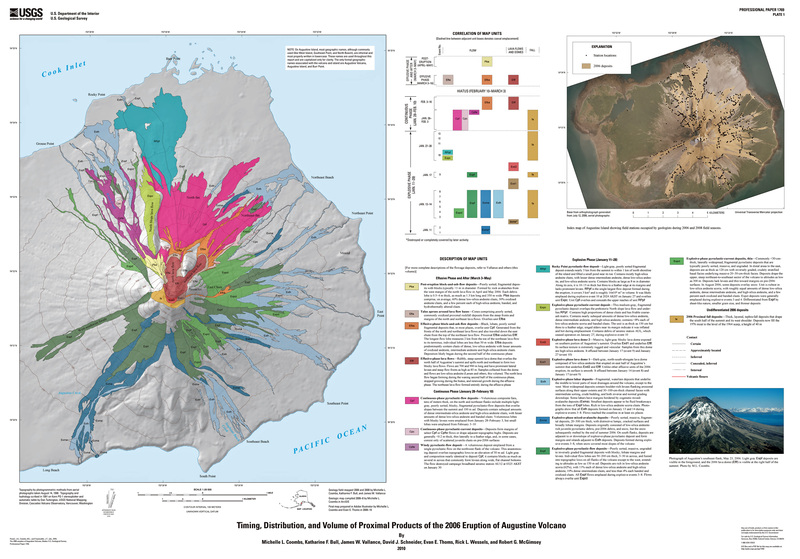 During and after the 2006 eruption of Augustine Volcano, we compiled a geologic map and chronology of new lava and flowage deposits using observational flights, oblique and aerial photography, infrared imaging, satellite data, and field investigations. After approximately 6 months of precursory activity, the explosive phase of the eruption commenced with two explosions on January 11, 2006 (events 1 and 2) that produced snow-rich avalanches; little or no juvenile magma was erupted. Seismicity suggests that a small lava dome may have extruded on January 12, but, if so, it was subsequently destroyed. A series of six explosions on January 13–14 (events 3–8) produced widespread but thin (0–30 cm) pyroclastic-current deposits on the upper flanks above 300 m altitude and lobate, 0.5- to 2-m-thick pyroclastic flows that traveled down most flanks of the volcano. Between January 14 and 17, a smooth lava lobe formed in the east half of the roughly 400-m-wide summit crater and was only partially covered by later deposits. An explosion on January 17 (event 9) opened a crater in the new lava dome and produced a ballistic fall deposit and pyroclastic flow on the southwest flank. During the interval from January 17 to 27, a rubbly lava dome effused. On January 27, explosive event 10 generated a pyroclastic current that left a deposit, rich in dense clasts, on the north-northwest flank. Immediately following the pyroclastic current, a voluminous 4.7-km-long pyroclastic flow swept down the north flank. Three more explosive blasts on January 27 and 28 produced unknown but likely minor on-island deposits. The cumulative material from the explosive phase, including domes, flows, and fall deposits (Wallace and others, this volume), was 30×106 m3 dense-rock equivalent (DRE). This geologic map depicts deposits from the 2006 eruption of Augustine Volcano, Alaska, including pyroclastic flows, avalanches, lahars, and lava flows and domes. Deposits from eruptions before 2006 are not differentiated. All geologic map information used to publish this plate is contained in the digital database. This map shows the distribution and relations of deposits from the 2006 eruption of Augustine Volcano on Augustine Island, Alaska. The database includes feature classes that depict map units and the contacts between them, station locations, and features used for geographic reference on the published map. For clarity in browsing the geodatabase and to separate new geologic data from geographic reference data, feature classes have been separated into two feature datasets; geology and basemap. The map was initially generated during the eruption but was greatly refined during a field campaign in the summer of 2006. Initiating the mapping as the eruption progressed allowed us to map the new deposits in a level of spatial and temporal detail not previously possible for the eruption of an Alaskan volcano. In some cases, we are able to distinguish deposits erupted during individual, minutes-long explosive events. Map units are introduced in the text in the order in which they were emplaced. Coombs, M.L., Bull, K.F., Vallance, J.W., Schneider, D.J., Thoms, E.E., Wessels, R.L., and McGimsey, R.G., 2010, Timing, distribution, and volume of proximal products of the 2006 eruption of Augustine Volcano, chapter 8 of Power, J.A., Coombs, M.L., and Freymueller, J.T., eds., The 2006 eruption of Augustine Volcano, Alaska: U.S. Geological Survey Professional Paper 1769, p. 145-185, 1 plate, scale 1:20,000, and GIS data.